So strictly speaking I guess that staircase design isn’t really a room design but part of the circulation space of your home. When you stop to think about how much time you spend going up and down the stairs it probably rivals with the amount of time you spend in the bathroom. These pages discuss both the style and the technical aspects of stairway design. The different staircase design elements are broken down and discussed separately to allow you to assess what might be the best staircase design for you. So there’s the obvious activity of moving from one floor to the next, but if you stop and think for a while, there’s a host of other needs and usage possibilities that can be accommodated by your staircase. It’s not only people that need to move from one floor to the next, but also stuff. How is your staircase design going to make it easier to store the items that need to travel between floors while taking safety considerations into account? How about the following alternative uses for the stairs? A great storage opportunity, either under the stairs or around the walls of the stairs for books and objects. A seat to sit on to put on your shoes. An opportunity to showcase and admire art, objects or family pictures on the walls or on the landings. A quiet place to sit or read if there are large landings. Stairs as a stage for carol singers at Christmas parties. The staircase is a very important design element of your home. Staircases take up a large volume of space due to the fact that two floor are involved. And that volume is not all that flexible since the bottom half of a staircase can’t be separated from the top half. Because of this (and yet still somewhat surprisingly) the placement of the staircase is one of the first things that should be considered in the design of a home and it’s one of the most difficult things to change later on in the design process, without considerable ramifications on the other spaces in the home. Here are some points to consider regarding staircase placement. The staircase can either be located centrally or in contact with an exterior wall. There are pros and cons to both these choices. If the staircase is placed centrally it won’t be possible to have a window, although the staircase can always be lit from a skylight above. If the staircase is placed in contact with an exterior wall then the window is possible. In homes with a small amount of exterior wall space (eg New York Brownstone) it is preferable to keep external wall space for rooms where windows are essential. Another choice to be made with respect to placement is where the stairs should be in relation to the other spaces in the home. The two most common placements for staircases include, commencing in the main entrance hall from the front door and commencing from a living space further inside the home. If you have a large home, consider having more than one staircase. A small additional staircase can create a more intimate flow than might perhaps be afforded by the main staircase. I have seen two particular arrangements that I thought worked really well. The first was in a townhouse which had the kitchen and dining space downstairs at the back of the home, and the adult drawing room on the first level at the back of the home connected to the dining space with a small staircase. This avoided moving from the kitchen, to the front of the home, up the main staircase and back to the back of the home to get to and from the main adult living spaces of the home. Another example was a staircase connecting the upstairs area where the kids bedrooms were located with the downstairs playroom. The last point we’ll discuss about placement concerns the configuration of the levels of your home themselves. Is your home going to be built all on one or two flat levels or is there an opportunity to add some interest by putting in some split levels. Split levels make a home more interesting to navigate and they can be used to create different ceiling heights. Staircases are in proportion to the rest of the home. Enhances and works with the style of your home. If the home is more than two floors, it isn’t too far to travel from one staircase to another to traverse more than one level. Includes all the features required to ensure safety. Just like everyone else, I love the great pictures you can browse through online. 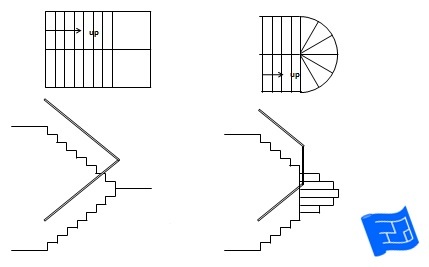 Here's a few on staircase design. I've made comments to illustrate the points I've made on these stairway design pages.